I’ll never understand just why Tom Zito saw so much potential for FMV games in such an already crowded market. I can understand how the games were considered ahead of their time in the 1980s when they debuted and they had some unique novelty but how on earth did he think he could keep them going so far into the future when such powerful new consoles were on the horizon? The Sega CD was a graveyard for FMV games during its entire lifespan and companies only succeeded in sinking the add-on and giving it a premature death. Now Digital Pictures decided that it has to make better versions of its games for Sega’s next failing add-on, but this time around it only succeeds in becoming pointless filler on the add-on’s already dismal library and nothing more. 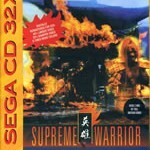 Supreme Warrior is a complete waste of time and a digital trash heap. A caption on the front cover of the case boasts digitally re-mastered for the 32X, 40% larger video, 25% sharper video and eight times more colors but at what cost? Let’s see, first you had the cost of re-purchasing the same video game at full retail price that you already own. Then, you have to have three consoles hooked up together and three power supplies which is a nightmare in itself just so you can have a chance to play quite possible the worst FMV game made to date with better video quality. Well guess what Tom Zito, it wasn’t a good tradeoff. I could care less about the better video quality here Digital Pictures, who obviously hired amateurs to film its videos because the camera is so jerky and unstable that it’s nausea-inducing, to say the least. It almost feels like the player in the game is the one with the camera strapped on his shoulders while fighting each round. The acting quality is so forced, it’s obviously made to be hammy but this is grade Z at best. Furthermore, the story is atrocious. If you’re going to make a movie game, can’t you come up with a better story than the standard “villain taking over the world and you’re the only one who can defeat him” scenario? 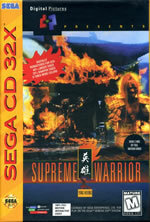 If you haven’t played Supreme Warrior before, it’s a first-person fighter. If you’re wondering how that would work then don’t worry, because it doesn’t at all. The fighting system is broken, you have to listen to some terrible dialogue before and during the fight. Then, each opponent comes at you, and the screen flashes commands for you to follow. Each has to be timed perfectly or you will be defeated in a matter of seconds. There’s a block icon, a punch icon, and a kick icon, and whichever side of the screen it appears on is the side you have to attack with. A majority of each fight will have you guarding and blocking until you have an opening. There’s just one problem: most of the blocks don’t work and you will be forced to take damage and lose fights and rely on luck. Attacks only cause damage when the icon is on the screen, even if the enemy is in range and should’ve been hit. There’s a total of twelve opponents to defeat, including the last boss, and after several go down you will gain special abilities to aid you in the upcoming fights. To add more insult to injury, each enemy has more and more health and can regain it during a fight. Each one also has to be defeated twice like every other fighting game. Many of the fights can take over five minutes each to end, and a fighting game that takes over an hour to complete is just wrong. In the end, Supreme Warrior is a failure on every level. It’s visually nauseating, its sound is muddy and muffled and not up to CD quality standards. It’s truly a waste of space in the 32X’s library and never should have even been released on the Sega CD, let alone on the 32X. it may actually take top spot as my most hated game in the whole Genesis library. I had fun with this game and beat it. I would say its the best made out of the 4 32CDX games with nice looking colorful video footage. Like i say i played it, beat it and would give 5 out of 10. By far the worst game in my collection. Hardly playable, unless you memorize everything, which is even less fun than not to. The awful acting doesn’t make up for anything (which it sometimes does a la “it’s so bad it’s good”).